Discussion in 'Red Sox Forum' started by Reverend, Apr 11, 2018. So, I've become associated with what could be the SoSHiest initiative since @jose melendez conspired to send a truck around Africa spreading awareness about the Red Sox (and also fighting HIV). Basically, the Pride of Hyde Park, Red Sox World Series Champion and all around swell guy, Manny DelCarmen is launching a program to combine athletics and tutoring and mentoring for Boston youth. This is a new project getting off the ground and seems like something really cool that we could support. Here's the flyer for the opening event, and then I'll post the press release. I've talked to a few others here (including our mod overlords) about this and I think this is a great opportunity for us to get involved in a really positive way that frankly is so much what we are about--not just for fundraising (but yes, obviously that!) but, given the talent and interests here, for real direct action in the community. Boston, Mass. (April 12, 2018) — Manny DelCarmen, Former Boston Red Sox Pitcher and 2007 World Series Champion, and his childhood friend José Diaz are proud to announce the launch of the Boston Athletic Academy, located in their neighborhood of Hyde Park. 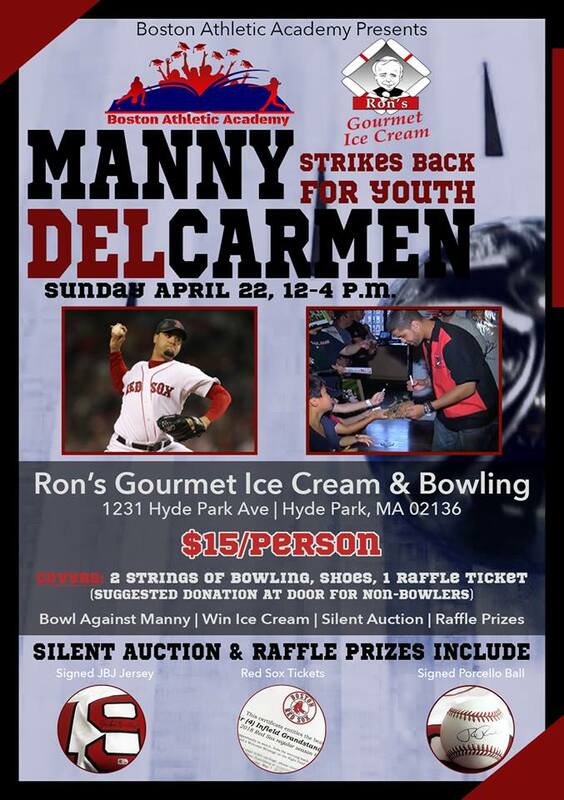 Boston Athletic Academy will kick off the official announcement with “Manny DelCarmen Strikes Back for Youth,” a bowling and ice cream event at Ron’s Gourmet Ice Cream and Twentieth Century Bowling Alley, located at 1231 Hyde Park Ave, Hyde Park, MA on Sunday, April 22, 2018 from 12 noon to 4 p.m.
Manny DelCarmen Strikes Back for Youth will feature the first look at renderings and images of Boston Athletic Academy, as well as the opportunity to talk with Manny, José Diaz and their team about their passion project, which will give kids the chance to further their baseball skills at the complex while receiving educational and college preparatory assistance. Guests will have the chance to bowl and compete directly against Manny for a chance to win free ice cream provided by Ron’s. Silent auction items will be up for grabs, including four Red Sox home game tickets with VIP experience, an autographed Jackie Bradley Jr. game jersey and a signed baseball from Rick Porcello. Cost to participate is $15 per person, which includes two strings of bowling, shoe rental and one raffle ticket. Non-bowlers are encouraged to make a donation to Boston Athletic Academy. Boston Athletic Academy will be located at 54 Walter Street in Hyde Park, featuring batting cages, artificial turf throughout the complex, a separate exercise area for strength and conditioning, pitching mounds and all necessary hitting equipment including, but not limited to, bats, baseballs, helmets and batting gloves. Boston Athletic Academy will also have classrooms where student-athletes have quiet areas to study, receiving tutoring and focusing on homework during the school year. For more information about the Boston Athletic Academy, please visit Boston Athletic Academy on Facebook, or email bostonathleticacademy@gmail.com. To register and confirm a spot for bowling, please visit www.eventbrite.com/bostonathleticacademy. So, anyone like baseball and helping people and education? I do, but I'm on the wrong coast. What's the age range of kids in the program? If it includes upperclassmen in high school, I'd be happy to talk to them about creating a resume, networking, the importance of finding appropriate internships, job seeking/interview advice, etc. Also happy to donate any artwork for fundraisers. High school kids with a plan for 9-12 college prep and mentoring. So this would be fantastic. To this end, BAA intends to establish a state of the art athletic facility that supports underprivileged student athletes in meeting their academic and athletic goals. Once realized, our sports and educational facility will fill the void left by competitors that are either too expensive to be accessible to low income families or ill-equipped to understand and address these families’ specific needs. We are currently in conversation to lease or purchase a building located at 54 Walter Street in Hyde Park. We have secured a vendor to install an indoor, multi-use-playing field covered with artificial turf and a basketball floor with a multi-use playing surface. In addition to making the facility available to our members and mentees, BAA will offer private sports lessons to the general public and will rent facility space for public and private use. Rental space and private lessons will be available at fixed rates on a half hour or hourly basis. Our fundraising efforts will begin through individual donations, and eventually expand into state-wide fundraising drives, including seeking corporate sponsorships. We will also seek the financial support of the local and state government through grants and other assistance programs. The former Red Sox pitcher has teamed up with his childhood friend Jose Diaz to build a center for student-athletes called the Boston Athletic Academy in their old neighborhood — and they’re throwing a kid-friendly party to spill some of the deets. Kicking off the new initiative, the duo is hosting Manny Delcarmen Strikes Back for Youth at Ron’s Gourmet Ice Cream and Twentieth Century Bowling Alley on Sunday. The event, which is running from noon to 4 p.m., will give guests a sneak peek at renderings of the Boston Athletic Academy, as well as the chance to chat with Delcarmen and Diaz about the future facility. If we’re talking specs, the Boston Athletic Academy is expected to be a fully equipped center for sports and educational services to provide local kids the resources to not only hone their baseball skills, but also receive scholastic support. The complex is slated to open at 54 Walter St. in Hyde Park, where it will have batting cages, pitching mounds, loads of baseball equipment and a separate exercise area for strength and conditioning. And on the academic side, it will also have classrooms where student-athletes can study, do homework, receive college prep and hold tutoring sessions throughout the school year. More details about the facility will be shared at this weekend’s event. Other perks of the party include: Bowling directly against Delcarmen, who now plays for the New Britain Bees, as well as bidding on silent auction items like four VIP Red Sox tickets, an autographed Jackie Bradley Jr. jersey and a signed baseball from Rick Porcello. Tickets are still up for grabs and include two strings of bowling, shoe rental and a raffle ticket. And even if you aren’t about to hit the lanes, you can make a donation to support the Boston Athletic Academy. I've also updated our mission statement (above) as the previous one sorta buried some of the lede of what we are about. I just wanted to thank SoSH and all the SoSHers who participated in this year's auction to raise over $10,000 for the Boston Athletic Academy. And I thank all you other SoSHers too, just for good measure. Not to mention the many people who didn't bid on anything but made donations--hat tip to you guys too. We really appreciate your generosity and will do good things with your donations. I'm new to this forum, and I still wish I was up in Cambridge. I would totally help out with this event especially for the kids of Hyde Park.